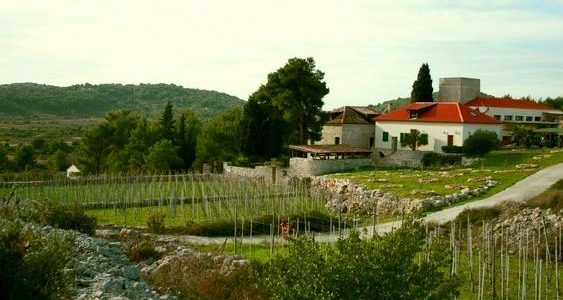 Country side villa, set in a small picturesque village Dracevo polje in the heart of island Vis and consists two charming stone houses , fully restored and stylishly furnished respecting the original architecture and the old tradition of a typical Dalmatian house. It boosts a spacious private mediterranean garden with a 50 sqm outdoor infinity pool with jacuzzi and beautiful terraces overlooking the vineyards and olive trees. It also offers a barbecue area with a big garden table ideal for alfresco dining. The main House sleeps 8 people. There are two bedrooms on the first floor each with double beds. A modern and tasteful bathroom with shower, WC, bidet, bathtub and floor heating is also on this floor. Kitchen with rustic charm is fitted with electric oven with hob, dishwasher, fridge with freezer, microwave, coffee machine. In the dining area there is a large dining table seating ten, overlooking the lovely fireplace. Small TV corner with 2 tabourets and a coffee table. On the second floor there is one double bedroom and a small room with 2 single beds and a bathroom. The large lounge area has a large sofa, table, big TV LCD and home cinema. A bookshelf provides a vast range of books, games and also a selection of DVDs and a CD collection to enjoy and create a home atmosphere. This house is fully air-conditioned and has wi-fi. The neighbouring House sleeps 4 people. It consists two large studio apartments with beautiful garden views. The first is featuring open bedroom corner with a king size bed. It has an ensuite bathroom with large shower, bidet and WC. Fully equipped kitchen with all amenities and dining area with round table and four chairs, lovely lounge area with a big LCD TV and large sofa which can open out into a sofabed. The apartment is ariconditioned. The other studio apartment is detached to first, entering into the expansive, luminous room, full of character with its exposed beams. It has an italian style sofa, coffee table, and round dining table with four chairs, large fitted wooden kitchen with bar chairs, and lovely feature open fireplace. This floor also includes an ensuite bathroom with shower, bidet and floorheating. From the sitting room, the stairs lead directly into the spacious open plan bedroom, a charming area with a king size bed. The bedroom has an ensuite bathroom which has a shower and a luxurious bath, WC ,bidet, floor heating. The apartment is air-conditioned. The fitness room is approx 30 sqm and contains different sports equippment. The laundry room has cleaning facilities, washing machine and two toilets. There are three private parking spaces. A small boutique winery is attached to the property. This villa is perfect for special celebrations and parties.